The FRITZ!Box's wireless guest access offers your guests a private hotspot and allows them to enjoy secure internet access. In this case, the FRITZ!Box provides an additional wireless network (WiFi) with separate security settings so you do not need to disclose the network key for your private wireless network. Your guests' wireless devices (for example notebooks, smartphones) are completely isolated from your home network. They cannot access your devices or the FRITZ!Box user interface. The FRITZ!Box must establish its own connection to the internet. It is not possible to set up guest access if the FRITZ!Box uses the internet connection of another router ("IP client mode"). For the "Name of the guest radio network (SSID)", enter the name that guests should see when they search for wireless networks. Select the encryption method from the drop-down list "Encryption". WPA2 encryption offers the best security. If you also want to allow other forms of internet access, disable the option "Restrict internet applications: Only surfing and mail allowed". If wireless devices should be allowed to exchange data with each other, enable the option "The wireless devices connected with the guest access can communicate with each other". Now guests who know the name of the guest wireless network (SSID) and the network key can use your private hotspot. Note:You can also use a FRITZ!Fon to disable guest access. This option is in the "Home Network > WLAN" menu. You can use the Push Service (under "System > Push Service" in the user interface) if you want to receive daily emails that tell you which wireless devices used guest access. 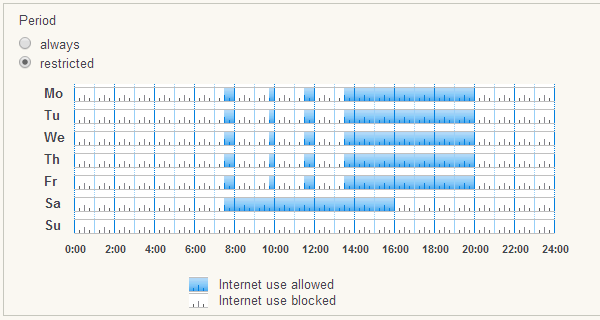 Enable the option "restricted" in the "Time Limit" section, and then hold down the left mouse button while you drag the mouse across the areas of the timetable when internet use should be blocked.